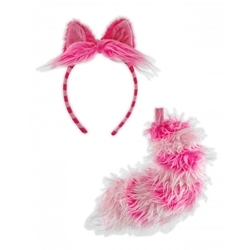 The Cheshire Cat Kit includes Pink and Fuchsia Cat Ears Headband and Tail as pictured. Dive into the madness made famous by Disney’s Alice in Wonderland with this officially licensed Ear and Tail set in the style of the Cheshire Cat! This Kit works well as a light, quick Halloween idea, or can be elaborated upon with matching striped clothing and makeup. Let everyone know that they’re crazy this Halloween with the Cheshire Cat Kit!